With Southcentral Alaska’s post-winter thaw underway, a more complete picture of damage from last November’s powerful earthquake is starting to emerge. Though many marveled at how well buildings and infrastructure held up, there’s still plenty of subtle damage that has remained buried under snow. And it is fueling optimism for a mini boom in the region’s construction industry. 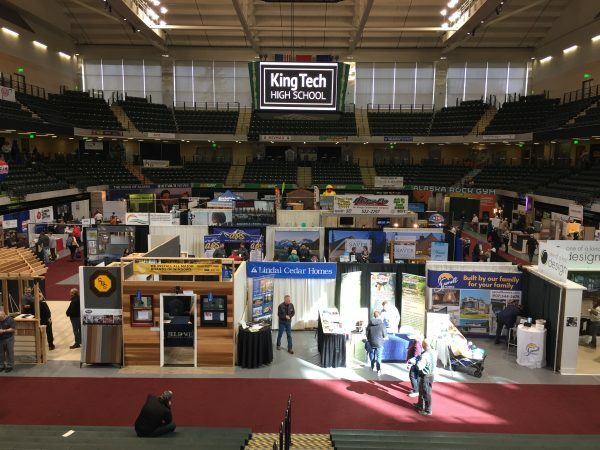 Over the weekend, the Alaska Airlines Center hosted the Anchorage Home Show, filling up with business booths advertising everything one could ever need to transform a house. The industry event brings together realtors, tree surgeons, asphalt experts, Tupperware merchants and every service in between. “Since the Earthquake we’ve had people who have been inquiring and I think they’ve been waiting to see the snow melt and get real damage reports. But it appears there’s going to be quite a bit,” said Darren Williams, manager of residential sales for Spenard Builder Supply. The company had a spacious walk-in display, modeled like a classy new kitchen. According to Williams, plenty of people have started wandering into SBS locations to begin figuring out home repairs. The projects run the gamut, from cracked sheet rock to righting whole foundations. It’s prompting a lot of businesses in the construction and building sector to anticipate a surge in demand over the coming months. But from where Williams sits, that boom is still on the horizon. “People haven’t got there yet,” he added. Williams thinks the other reason cash hasn’t started to flow is that people are still navigating the process to receive recovery funds from insurance and FEMA. For 21 years, Cody Lee has run a medium-sized construction business in Anchorage. Since the earthquake, the advice he’s given home-owners about repairs and remodeling is to just hang tight. Lee is handling his existing clients before taking on new customers later this season. He, too, has a rosy outlook for his business. But its based less on people fixing actual earthquake damage than those repairs inspiring property-owners to use the opportunity for other home-improvement projects. For Lee, “fun work” means a new deck or a kitchen remodel. Projects that improve daily lives. There might be more of that in the next couple months that you’d expect. Anchorage’s housing market may have survived the earthquake relatively unharmed. After the quake there was concern potential home-buyers would be wary of a major investment that could literally collapse around them. But realtor Debraly Gamache’s work has not slowed down. “I haven’t really noticed a difference at all,” she said. In fact, Gamache thinks the housing market is actually beginning to creep upwards. One change she has noticed since the quake: housing inspections involve more thorough hunts for typical earthquake injuries. “So far, what I’m seeing is everything looks really, really good,” Gamache said, attributing the housing stock’s solid performance to the municipality’s building codes. Some financial institutions are also looking to seize on new quake-related business. The Alaska Housing Finance Corporation is hoping property-owners looking to pay for damages will go a step further by taking advantage of a flexible loan program they offer that covers additional improvements. “Our theme for this convention is: on a scale of 1 to 7.2, how badly does your house need renovation?” said Mark Romick, deputy executive director for AHFC. As a public corporation, AHFC is set up to take on more risk than most lenders. They not only help property-owners secure loans at a lower rate, but will also base loans on the projected value of a completed home project, rather than just the original purchase price. These particular renovation loans aren’t new for AHFC, but the November earthquake created an opportunity to highlight them for Alaskans. “I think we all anticipate that this summer will be a very busy one for renovation contractors and other people, so homeowners can get their houses fixed,” Romick said. With the state still in recession, and in a city without much new construction, the building sector is banking on a silver-lining to the November earthquake.